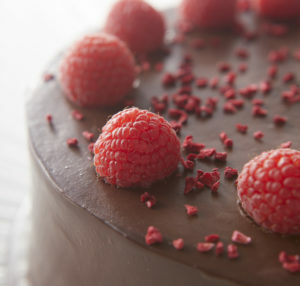 Learn how to make our deliciously decadent Chocolate Raspberry Velvet cake, which also happens to be vegan! 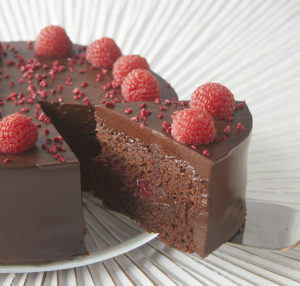 The rich chocolate cake has raspberry jam baked into the sponge and is sandwiched with raspberry compote, then lathered in a silky dairy-free chocolate ganache and finished with fresh and freeze dried raspberries. 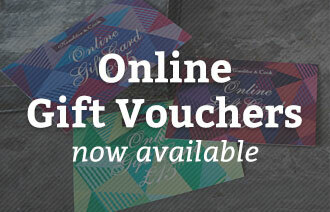 Preheat the oven to 175C/Gas Mark 4, and line two 7” cake tins with baking parchment. To make the sponges, mix flour, cocoa, baking powder, bicarb, salt and sugar together in a large mixing bowl. In a microwaveable bowl, mix soy, oil, jam and vanilla. Heat till warm to touch, not boiling. Mix well. Add wet ingredients to dry and thoroughly combine. For the ganache, put soy milk and golden syrup in a plastic bowl, cover with cling film and poke a few small holes. Heat in the microwave until boiling point is reached. Pour hot (but not boiling) soy over chocolate buttons and vanilla. Stir till well combined; do not incorporate too much air into ganache. To make the raspberry compote, heat frozen raspberries, icing sugar and lemon in pan until boiling point. Simmer till slightly reduced, then chill. To assemble the cake, fill the centre of one sponge with 100g of compote and pipe a ring of ganache around the edge to ensure it does not spill out. Sandwich the sponges together and set the cake with ganache, then chill. Once chilled, smooth out the ganache for a neat finish. To garnish, place fresh raspberries around border, equally spaced. 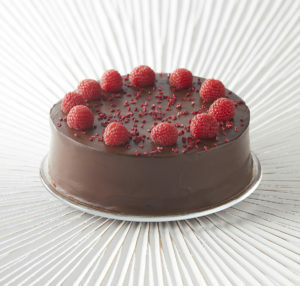 Scatter with freeze dried raspberries and enjoy! Keep chilled for up to 5 days.